Turkey breeders have used artificial lighting schedules for many years. As new technologies are introduced, along with changes in genetic breeding goals, there are opportunities to utilize lighting to improve overall production even more. Lighting requirements for turkeys vary throughout their life and are dependent on their physiological needs as well as their role in the protein value chain. 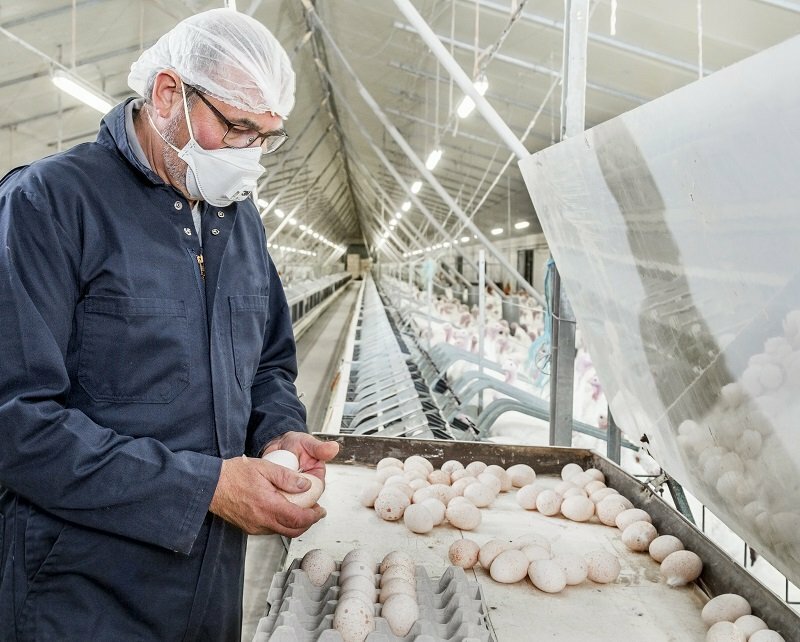 Proper control of the light environment will enhance turkey performance when reaching physical maturity and throughout their production cycle. On the first day of placement, it is recommended to give birds 20-22 hours of light so they become familiar with their surroundings and seek out food and water. In the following days and first weeks of life, up to 17 weeks old, it is recommended to mimic natural daylight with approximately 14 hours of light and 10 hours of darkness per day. This will allow plenty of time awake when the birds can seek out feed and water to reach their growth potential during rearing. The next stage of the lifecycle, from week 17 – 30, is called the conditioning phase. During this time it is recommended to decrease the amount of daylight to 6 hours per day as a means to condition hens and prepare them for egg production. Egg production is initiated through photo stimulation, generally beginning at 29 – 30 weeks of age. Photo stimulation is achieved by re-introducing light at longer intervals. When lengthening daylight hours, it is recommended to always add the extra light in the morning. Light controlled barns: Increase day length back to the original length of 14 hours of light. Periodic light increases during the production period, up to a maximum of 17 hours, can help to sustain good egg production. The lengthened day length encourages bird activity, egg production and helps to prevent floor layers. Non-light controlled barns: In curtain-sided barns, it is imperative to have the hours of daylight meet or exceed the natural day length, if longer than 14 hours. Once a day length is established in the production phase, you must ensure this length of light remains, even if natural light begins to decrease. This can be accomplished through artificial lighting. Use of timers is recommended to ensure consistency in the management of day length. Timers should be checked on a regular basis to ensure they are working properly. Light intensity is measured in LUX or Foot Candles, depending on where you live. Measurements, using a light meter, should always be obtained at bird level to get an applicable reading. The table in Diagram 1 highlights light intensity recommendations throughout a breeder female’s lifecycle. It is recommended that on the day of placement, poults receive light intensity of 100 LUX (10 FC). From approximately day 2 up to 17 weeks of age, light intensity can drop down to a minimum of 50 LUX (5 FC). When the birds are ready to begin laying, approximately 29-30 weeks of age, the light intensity should rise to a minimum of 100 LUX (10 FC). This higher intensity light should continue until the end of the lay period. Female breeders prefer to lay their eggs in dark or shadowed areas. Therefore, it is recommended that during the lay period, the light intensity is approximately 40-50% less over the nests versus the rest of the barn. Light intensity from a bulb can decrease over time or can be reduced from dust build up in the barn. Bulbs should be serviced frequently and replaced when necessary to ensure optimum light intensity and coverage. Uniform distribution of light throughout the barn is a key factor in a successful lighting program. When evaluating your barn, whether setting up new lights or looking at your current set up, it is important to consider the angle of light dispersion. There should be no gaps in lighting on the floor. 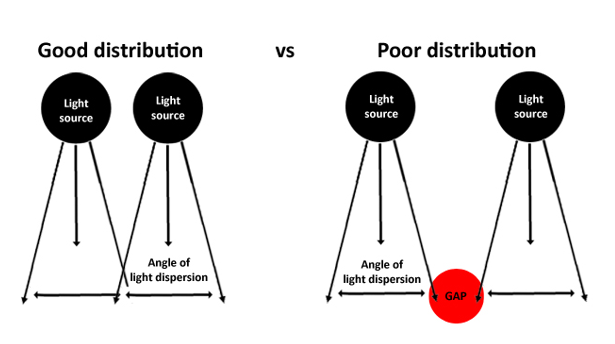 Gaps can be created if lights are spaced too far apart (see diagram 1). These dark or shadowed areas can increase the risk of broody behaviours which will affect overall flock performance. Color spectrum is not a new concept in poultry lighting; however, it has come back into the conversation with the introduction of LED lights. 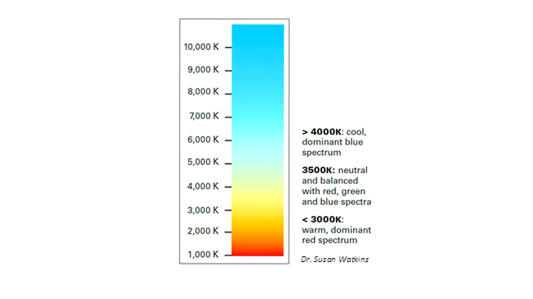 The recommended color spectrum, also known as color temperature, varies based on the role of a turkey in the value chain. For breeders, the recommended color spectrum should be between 2700 and 3300 Kelvins. This equals a warm, dominant red temperature that is optimal for development of the reproductive organs. It is important to understand that turkeys receive and interpret light differently than humans. Lights can seem perfectly normal to a human eye, however to a turkey, a light that is not installed correctly or that has faulty wiring can produce a flickering effect which can lead to an increase in aggressive behavior in a flock. Therefore, when updating your lights, it is recommended to check with an electrician to ensure you have proper wiring and dimmers that can handle the newer technology. The best way to ensure all essential factors are in check is to do floor walks throughout the day. For more information on lighting for breeders and other management recommendations please visit our resources.